Friends, note: I keep my promises. On a recent episode of The Table Set, I divulged my obsession with creating an aromatic bitters ice cream. Peychaud's Bitters, to be exact. These magical Creole bitters are sweet, floral and fruity; the classic invisible touch in a true New Orleans Sazerac. In ice cream, they add a pretty pink hue - Fitting for this grown-up bittersweet bubblegum confection. 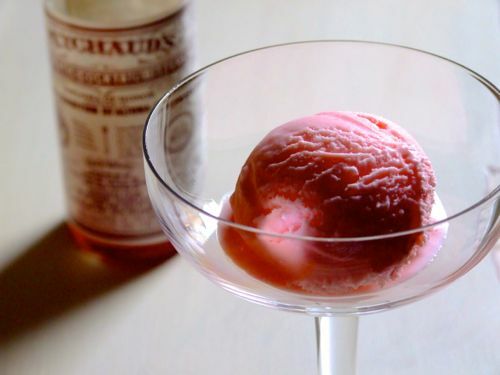 Thinking I was on to something pretty brilliant, I then read in the LA Times that Giovanni Martinez of Sadie LA also created a Peychaud's ice cream that he floats in Pellegrino Sanbitter soda. Touché, good sir. But I say up the ante. Sanbitter is essentially a virgin Campari n' soda, let's call a spade a spade, shall we? I digress. Back to promises. And a perfect nightcap, in or out of your cocktail. If using an automatic ice cream maker, make sure bowl is completely frozen before starting. Whisk the chilled milk and cream with sugar until completely dissolved. Stir in the bitters. Pour mixture into ice cream maker and follow the manufacturer's instructions (should churn for about 25 minutes). Cure in freezer for at least two hours or overnight before serving. I just listened to the ep yesterday and was hoping you actually made this! And it looks beautiful! A nice recipe for the holidays.